“In the village of Lauscha in Germany, things have been done the same way for centuries. The men blow the glass, and the women decorate and pack it. But when Joost Steinmann passes away unexpectedly one September night, his three daughters must learn to fend for themselves. Feisty Johanna takes a practical approach to looking for work, Ruth follows her heart, aiming to catch a handsome young villager”, and quiet Marie develops her talent for glassblowing. 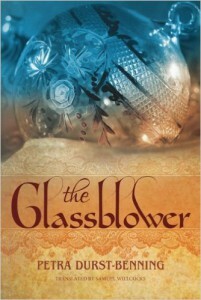 This title, by Petra Durst-Benning, and originally published in Germany, is the first in the Glassblower Trilogy. I was fascinated by the description of the intricacies of glass-blowing, the process of how artist’s wares were bought and sold in late 1800’s Germany, and of course, the sister’s trials and tribulations through it all.